Christopher Hampton's most celebrated hit play returns to the West End. 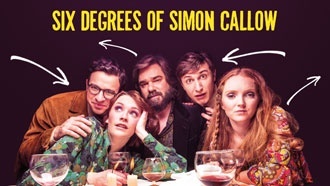 Simon Callow’s new production stars: Matt Berry (The IT Crowd, Toast of London), Simon Bird(The Inbetweeners, Friday Night Dinner), Lily Cole (Ab Fab The Movie), Charlotte Ritchie(Call the Midwife ) and Tom Rosenthal (Friday Night Dinner). This production features the firing of a gun and a loud gunshot. Lily Cole will not be performing at the matinee performance ONLY on Thursday 1st June due to a pre-arranged event. To pick your own seats for The Philanthropist at Trafalgar Studios simply find the performances you'd like to see from the listings below and you'll be given the option. Tom Rosenthal (Friday Night Dinner, Chicken Soup with Barley – Royal Court). Read about how this famous bunch and their friends are all connected in our feature Six Degrees of Simon Callow.